Hi loves! Sunday night already, the weekend is almost over.. oh well, if I didn't make money it would be a hard task to support this blog right ;-)? Today I am showing you a manicure I L-O-V-E-D! So much, the combo was just perfect to me. Nikole was so sweet to sent me 4 polishes from her recent collection called The Last Queen of France, which is made up in 2 parts actually: toppers and jelly based polishes. I got 4, 2 out of both sections. 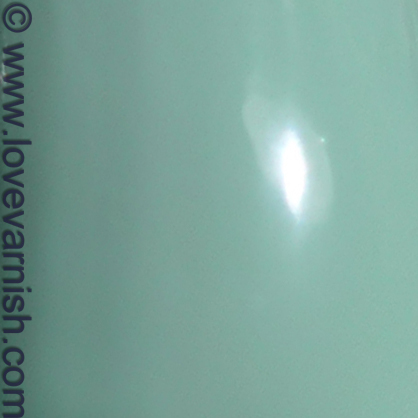 The Bondi NYC polish, Lady Liberty, was such a blessing to work with too. It applied effortlessly in 2 thin coats, drying quickly (when I layer glitters I want my basecolor to be dry to prevent scratching/dragging). It doesn't have a high gloss finish but it isn't like I'd wear it without topcoat anyway. I like the brush on their bottles, it is small and round, I work best with round brushes! The bottle cap is easily to hold, the rubber finish gives a nice grip. Dauphine of Decadence as described on the HARE website: "this is a mixture of gold glitter in several sizes of hex & square glitter, with a sprinkling of pale mint green hexes as a subtle accent. This shade also features striking gold shimmer! This is in a CLEAR base." It indeed has gorgeous golden shimmer, and the pale mint green hexes are just ♥. 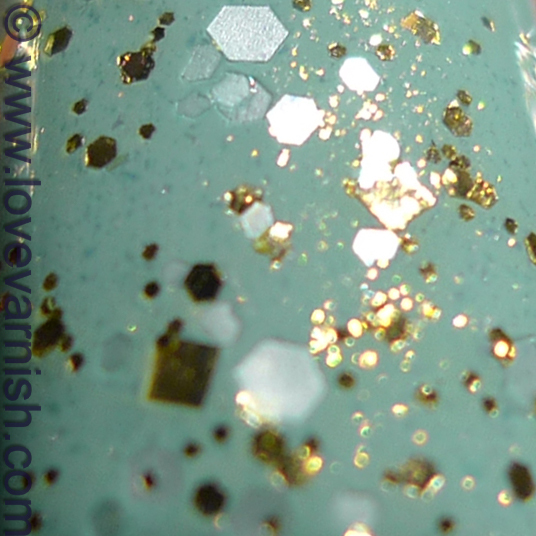 It combined so pretty with my basecolor, Bondi NYC Lady Liberty, with the mint green glitter still visible but almost blending in, and the gold shimmer that just stood out so pretty. Application was easy peasy, it spread nicely, no glitter fishing, nu dragging, nothing. Just, simple application and it dried smoothly too! Do you like this combo as much as I did? And did you get any of the HARE The Last Queen of France polishes? Tell me in the comments! HARE can be found at various retailers, check their website for more information. You can also find HARE on Instagram and Facebook! I also got four of the new Hare polishes but this is the only topper I got. This is just the type of combo I was thinking of doing! I love it! Looks amazing. I haven't tried this one yet, it's one of the 4 (or is it 5?) I picked up. Love the combo you made with it! I have never tried Hare polishes, but this is so pretty! Lady Liberty is such a lovely green!!!! Love the addition of the HARE glitter. Such a pretty combo! Wow, these polishes were made for eachother! Gorgeous!! Great minds think alike! Hope you enjoy it as much as I did :). Thanks Angie! I think this is one of HARE's must haves ♥. Thanks Vicky, I looove HARE! It is! A tad lighter than OPI Thanks a Windmillion, but with the same dusty feeling to it. And since I am obsessed over the OPI, I am obsessed with this one ;-). Thank you! They were sitting next to each other on my desk and I just couldn't pull them apart ;-). These are gorgeous together! I have Lady Liberty and it really is amazing! beautiful! this combination just looks so decadent! It certainly is ♥ thanks dear!